There’s a new home for seafood lovers in the Walnut Creek area. Pacific Catch, the regional chain that’s grown from a single San Francisco location, which opened in 2003, has just opened its eighth restaurant —and its second in the East Bay. It’s safe to say that if you get excited about the bounty of the sea, you’re going to find something you like here. Pacific Catch offers a wide variety of seafood, from pokes, ceviches and tatakis to sushi, fish tacos and much more. 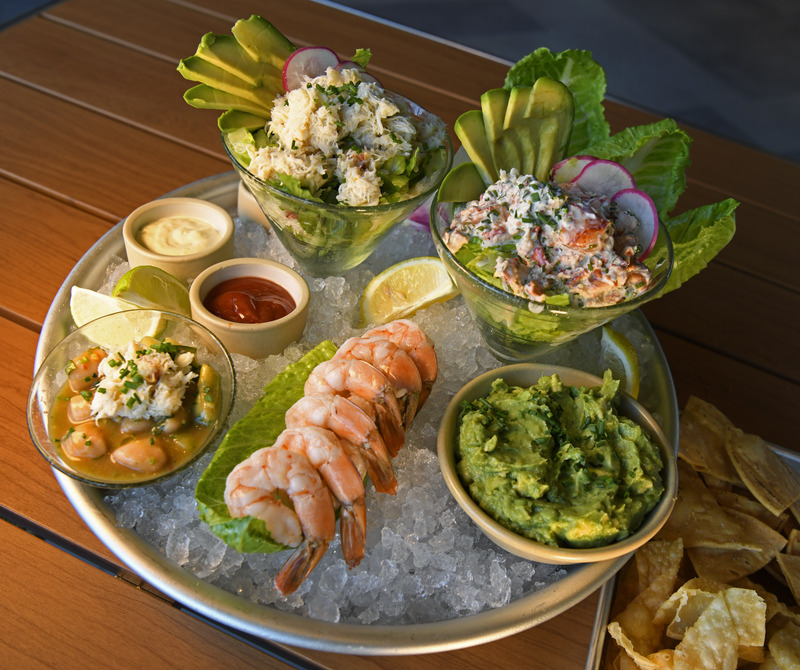 Pacific Catch shares a lot of DNA with another seafood chain that recently appeared locally — EMC Seafood, which grew out of Southern California before expanding with restaurants in San Jose’s Santana Row and Concord. THE VIBE: On the evening of our visit, the ambience approached perfection: We sat on the patio overlooking the creek, the burble of water keeping things mellow as we enjoyed a beautiful sunset. Inside, Pacific Catch is sleek and clean, with a look built on straight lines and rich wood that suggest an Asian influence. THE FOOD: Pacific Catch’s menu tip-toes right up to the edge of what’s considered an overwhelming amount of choices. As with so many restaurants embracing family-style dining these days, Pacific Catch encourages you to share, and once you start picking out things you want, you’ll see why. It’s easy to order a lot when you keep saying “ooh!” as you look the menu over. Little matter, though, because the Kanpachi Crudo ($15) was wonderful, sliced thin as a cracker, layered with avocado slices and watermelon radish and served with a white ponzu sauce. Pacific Catch’s raw seafood choices include cocktails with shrimp, lobster or crab, and a series of platters and towers that offer samplings of the entire raw menu, from $23 all the way up to the “Going All In” ($125), which has a little bit of pretty much everything. Beyond the raw bar, there are bowls built on bases of rice and greens, as well as sandwiches, fish entrees and more. The tacos (2 for $14, 3 for $17) were big, with crispy shrimp and cod pieces in a mild jalapeño tartar sauce. DON’T MISS: The lobster roll ($23) was, well, a mess, but a very tasty mess. Stacked high on a pair of King’s Hawaiian rolls, big pieces of lobster swam in a creamy tarragon-dill sauce, with avocado and radish rounding out the package. PERFECT FOR: An above-average working lunch (maybe celebrating getting that big account?) or an evening with friends, where you order so many things that no one tries the same dish twice, but everyone leaves full and happy. DETAILS: 1305 S. Main Street in Walnut Creek; open 11 a.m.-10 p.m. Sunday-Thursday, until 11 p.m. Friday-Saturday. Locations also in Dublin, Campbell, Mountain View, San Mateo and more; www.pacificcatch.com.